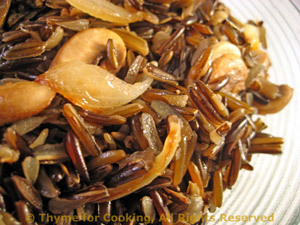 Wild Rice with Mushrooms and Onion, Thyme for Cooking savory side dish. Wild rice is a grass, rather than a rice. This is finished with sautéed mushrooms and onion. This makes enough for 4; or 2 with half left for another use. Rinse rice and put into a medium saucepan. Add stock, water and bring to boil. Cover, reduce heat and simmer for 40 - 45 minutes. Heat butter and oil in a large, nonstick skillet. Sauté onions for 5 minutes. Add mushrooms and continue to sauté until both are light brown. Add rice , sherry, stir well, cover and heat through. Serve.